Body oils are a great addition to your skincare routine and I definitely rely on them more during the Winter. I have a little tip to share. My skin becomes so dry that I apply oils before jumping into the shower. It sounds weird but it makes a huge difference especially when shaving my legs, it prevents my skin from bleeding and soreness. Nathalie Bond has a lovely range of body products and candles. They offer a couple of unscented products which is handy for those who have issues with essential oils (although not suitable for vegans). 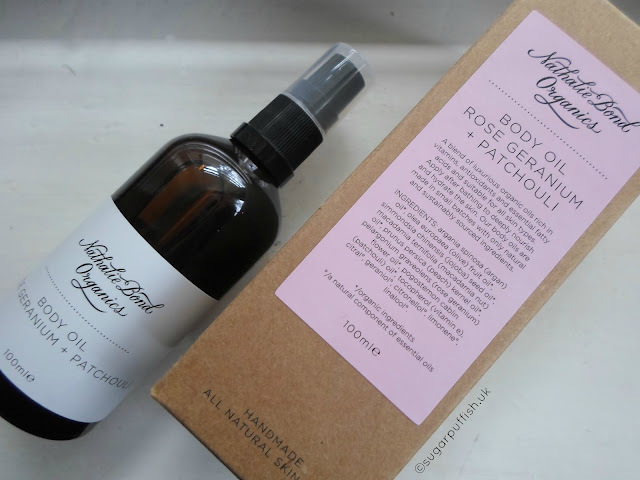 The *Rose Geranium & Patchouli Body Oil from Nathalie Bond Organics is a gorgeous product. I find the scent the perfect aroma and not too overpowering. This oil is a blend of argan, olive, jojoba, macadamia and peach kernel. It doesn't feel greasy and my skin easily absorbs this product which is nice for times when you need to get dressed quickly. I know that the product inside the bottle is what counts but I can't fault the packaging. It looks lovely on my bedside table and elegant enough to gift to others and feel good about it. The body oil is also available in Lavender and Chamomile, ingredients that are often suitable for sensitive skins. For the full pampering experience you can pair your oil with bath salts. Have you tried any products from Nathalie Bond? Do you have a favourite?